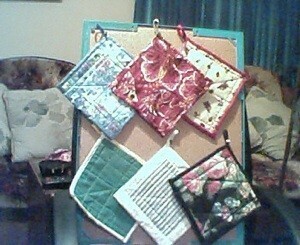 Fabric scraps can easily be made into beautiful potholders, both simple and more complex quilt style blocks. 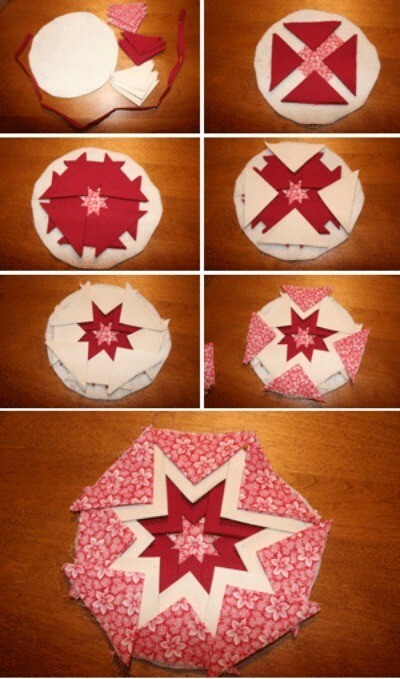 This is a guide about making potholders from fabric scraps. I have a lot of fabric and a lot of scraps leftover from my projects so I decided to make some potholders from the scraps.I have not been able to master the binding that goes around the edge so I tried something different. I cut some 2 1/2 inch strips (4 per square) and sewed each one to each straight edge (after quilting the square), folded down the end and sewed across it. For loops, I made some from the matching material or you can use bias binding that's been sewed together. These binding strips are cut into 5 inch pieces, fold one in half and insert into end of potholder and sew across. You can use most anything to sandwich between the potholders, but I find old flat blankets or fleece at the thrift store work well. You can even use old clothes, the possibilities are endless! I have made 100 or more so far and they are selling like hotcakes, can't make enough of them and they are very easy to make. Oh and these are cut into 9 inch squares. Hope you enjoy making these potholders as much as I do. Question: How Can I Make Potholders From Scrap Material? Does anyone have easy directions for making fabric potholders out of left over material that are both pretty and useful too? Thanks and God bless! I used to make my own potholders. A good padding is mattress protectors. They are thick and they have seams throughout. I would look for some at thrift stores (new in package), or garage sales (new) or catch them on sale. They go a long way considering the size vs. price. Same with sheets. They can be a great bargain in terms of price vs. amount of material. You might consider covering them in sheeting material (you can use double thicknesses of material and probably should for pot holders. Don't try sewing in the thick areas, sew a seam around a thinner area. I agree with the previous poster, don't make them too ornate unless you don't plan to actually use them. It is a shame to have a beautiful potholder and then get it scorched and stained.